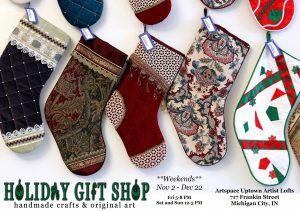 Open WEEKENDS through December 22nd. FRI 5-8pm, SAT & SUN 12-5pm. All items for sale are created by local and area artists. Open weekends from Friday, November 2nd through December 22nd. PLUS our Artspace After Hours Party following the ArtWalk from 8-10pm featuring music, poetry, more music and drinks. FREE ADMISSION!!! Also on December 7th check out the POP-UP Book & Zine Shop.